In late Spring I ran across some Cosmos seeds that I'd bought probably 6 weeks earlier so I decided to plant some in the front yard. I planted probably 16 seeds and only got 4 plants, but they sure are pretty. The do pretty well as a cut flower too, but you don't get a very long stalk with them unless you want to sacrafice some buds below the bloom; which isn't an option. 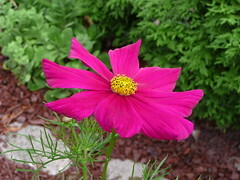 Cosmos look very cool in bunches and they sway easily with the wind.